We got our pit last year and LOVE IT!!! We've gone through a cord of wood in less than one year thanks to y'all! 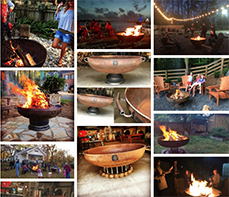 This handcrafted 30” Decorative hemisphere Fire Pit sits approximately 22” off the ground. This pit is all welded; it has re-purposed handrail parts for the base and handles, has a 1⁄2” drain hole to keep water out and comes with a free handcrafted 46” Fire Poker. 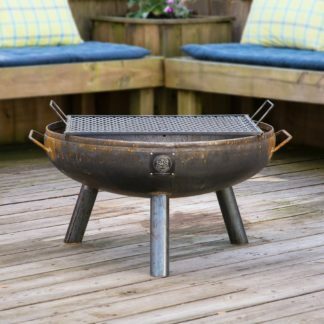 This Fire Pit is designed to easily service 2-10 people at any gathering.